Xi, accompanied by his wife Peng Liyuan and other senior officials, arrived in the French capital on Sunday as guest of French President Francois Hollande and Laurent Fabius, France's foreign minister and chair of the 21st session of the Conference of the Parties (COP21) to the United Nations Framework Convention on Climate Change (UNFCCC). Xi is to address world leaders on Monday at the long-awaited United Nations Conference on Climate Change in Paris. He is expected to defend the interests of developing economies on climate change by urging rich countries to transfer technology and capital. It will be the first time for China's top leader to be present at the UN climate change conference. A total of 147 global leaders are attending the conference just two weeks after a series of terrorist attacks left scores dead and hundreds injured in the French capital. They have entrusted their negotiating teams to strike an ambitious landmark climate change deal after the United Nations concluded the Kyoto Protocol in 1997 and the Copenhagen Accord in 2009. 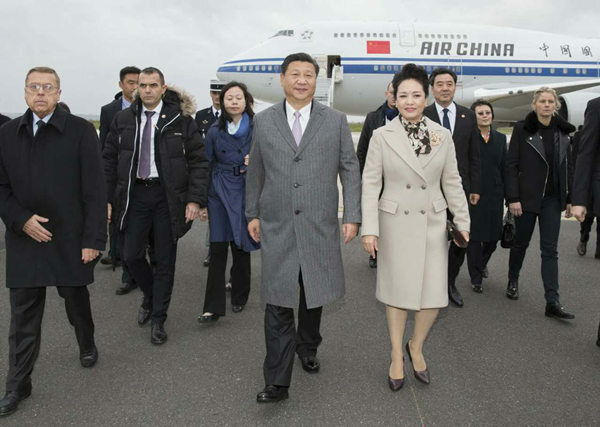 Xi and first lady Peng Liyuan arrived in Paris on Sunday before leaving for visits to Zimbabwe and South Africa. Observers say he may entrust his negotiating team with more flexibility to maximize global efforts to limit temperature rises to below two degrees Celsius until the end of this century. They say this scenario will occur only if advanced economies commit more at the negotiating table. China has already announced an ambitious plan to boost its energy intensity while saying that its carbon emissions will peak around 2030. Observers have also been keeping a close watch on the actions of Xi and United States President Barack Obama after they made two statements on climate change in 2014 and this year. Niels B. Christiansen, president and CEO of Danfoss, a global producer of products and services, said China has been "quite proactive" in building a low carbon economy with the launch of a "green revolution" under Xi's leadership. "We believe China will take a more active role at the upcoming conference as its importance in the global economy continues to grow," Christiansen said. Samantha Smith, leader of the World Wide Fund for Nature Global Climate and Energy Initiative, said Xi's presence in Paris shows that he is committed to getting an agreement. Isabel Hilton, CEO of the China Dialogue Trust in London, said the presence of Xi and other leaders in Paris shows the serious commitment to tackling climate change. "Without political leadership, it will not be possible to make the necessary progress on limiting emissions," Hilton said. Dale Jamieson, a professor of environmental studies at New York University, said Xi's attendance in Paris along with the other leaders is very important as he has indicated that he wants China to be part of the solution to climate change. "The significance of the Paris summit lies in providing a direction for global sustainable development and making more people aware of the urgent challenges facing humanity and how to make adjustments." "China was the first developing country to put forward national goals for cutting emissions. This year, almost all developing countries have such goals, so the Paris conference is a landmark one." "China has become one of the world's largest emitters in terms of annual greenhouse gas emissions. ... It could make a change if we adopt a low-carbon development strategy and adhere to an ecological civilization. But if we hesitate, we may miss this historic opportunity for transition." "An unreasonable industrial structure, energy structure and transportation are major causes for China's environmental problems, and their restructuring is inseparable from promotion of a green financial system." "We have commitments by all the major economies and the majority of countries to work actively toward mitigation and adaptation, which is extremely important and also makes this conference very important."